Take a trip into the woods and visit our cute animals in our new Woodland collection. 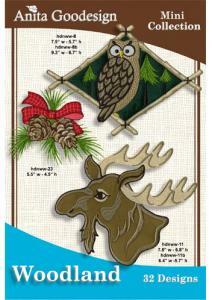 These designs are perfect to decorate pillows, quilts and even clothing. These designs will compliment any decor and are perfect for the colder months. There are moose, bears, deer, a raccoon and squirrel. There are plenty of motifs and design variations to make any project complete. For our projects we created three different pillows using the large designs. Any standard pillow pattern with a large blank center area would work fine for these designs. Choosing fabric for these designs is easy as well. For the base fabric we chose red twill and for the border fabrics we chose an assortment of wool plaids. There are tons of plaid fabrics available at any fabric store. When matching your designs to the fabric simply choose a color from one of the plaids and incorporate it into your embroidery design. Tutorials, Re-sizing program, Catalog and design color sheets included!